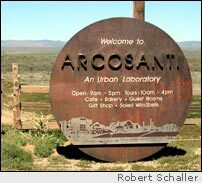 "Welcome to Arcosanti: An Urban Laboratory"
In addition to daily tours, Arcosanti offers workshops, internships, and other events throughout the year. Limited lodging is available on site, and there is a café and bakery. Directions:Take the Cordes Junction/SR69 exit from I-17 in central Arizona (about 65 miles north of Phoenix), and follow the signs. Over one thousand years ago, southwest Indians built cities into canyon walls. They did this for several reasons, among them efficient use of land and resources. 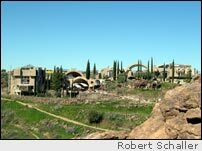 Today, north of Phoenix, architect Paolo Soleri is building a city the same way they did, and for some of the same reasons. 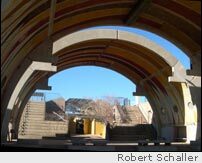 Arcosanti is located about two miles from Cordes Junction, Arizona. Since 1970, it's been Soleri's ongoing experiment in "arcology," his term for the synthesis of architecture and ecology. Arcology embodies the idea that the design and construction of a habitat, and the way it functions, should both be driven by its natural setting. Newsweek magazine, according to Arcosanti's brochure, said that Soleri's work "is probably the most important experiment undertaken in our lifetime." After 35 years, Arcosanti's buildings cover 25 acres, and Soleri owns the surrounding 4,000, which provide a buffer to protect Arcosanti's future and room for completing Soleri's plan. The latest model envisions a self-contained city of 5,000 people. Today, only a fraction of it has been built. His ideas seem to be working, although not as quickly as he must have hoped. Today, 103 residents call Arcosanti home and a number of others work there each day. The brochure says hours and tours vary. I arrived at 1:20, expecting a scheduled hourly tour at 2:00. I discovered the next tour was not until 3:00. I also discovered the café was closed - not to reopen until dinner, presumably. As long as you know this, no problem - there is food available within a few miles in any of three directions. I suggest visitors call ahead to see what the schedule is for that day, rather than be surprised on arrival. Awaiting my tour, I hiked a trail across the canyon floor to climb the opposite wall (for photograph opportunities). This involved negotiating a small creek by means of some rocks. 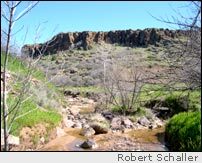 It was a pleasant hike in springtime sunshine, but I'm sure that creek dries up as summer approaches, and temperatures here in June would make afternoon walks an exercise in desert survival. But in spring or fall, it's beautiful. I found that Soleri takes no particular stock in paint. The buildings of Arcosanti are predominantly pre-formed natural concrete, with a solitary unfinished wood window frame here and there. Drawings of the completed Arcosanti depict it standing dazzling white underneath an Arizona sky, but for now, the reality is not so pristine. While striking and dramatic, much of the architecture is less than aesthetically pleasing. Tour guide Josh said it was Soleri's stated opinion that once you begin to paint, you will be painting forever after. Here we find pragmatism encroaching upon the dream. Soleri no doubt sees himself as a pragmatist, but he is also a dreamer. It looks like his dream may work, even if many of us aren't ready for his ideas yet. In the future, when exploding populations bring increased problems for us, Soleri's experiment in the Arizona desert may provide insights toward practical solutions. Meanwhile, a visit to Arcosanti is a fascinating glimpse into the lives of the pragmatic dreamers who are living and working in the desert. Little by little, they're creating a different style of life.